– 1.35KG weight well-build rifle body. 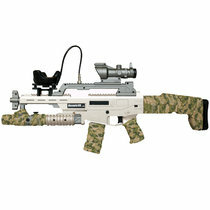 – Strong power recoil feedback, adjustable buttstock, on/off recoil. 10x 10 meter (32’x32’) Room Scale tracking. – Vive Tracker is not include with this price. – Vive tracker 1.0 2017 version is not compatible. International air express from China USD85-100, Air express is expensive because handled by special shipping line, not regular cargo. It has risk to destroy, return by custom due to battery included and gun shaped looking product. Please contact sales@magp90.com, rockyho@beswin.cn if you have wholesales order to decrease air freight or sea shipping. Trackpad touch is not 100% functional due to Tracker 2.0’s bug, only central press-key function works, touch tracking function (up, down, left, right) can’t work. 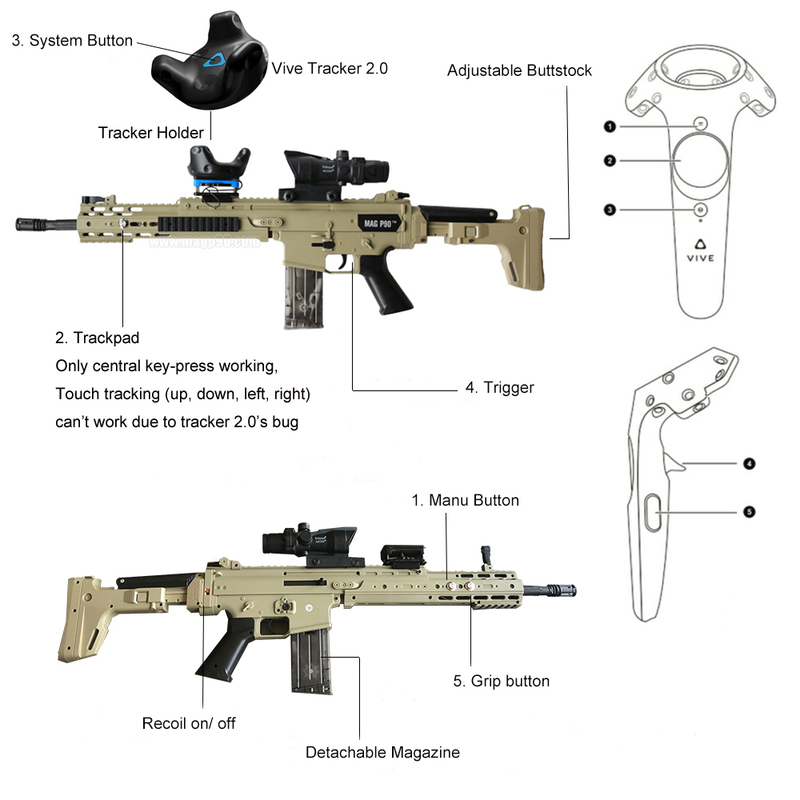 It caused many VR game requiring Trackpad touch (up, down, left, right) is not compatible with AK47VR 2.0 Rifle. Old tracker 1.0 won’t has this problem but stop production. We are waiting for HTC Vive company to fix it. – Windows regard Tracker role changer as virus, please shut down windows defender before download it. – Unplug usb of Vive HMD before doing tracker role changer on PC, otherwise HMD will damage, Very important!!! – Attaching Vive tracker 2.0, Compatible with HTC Vive pro 2.0 and 1.0 tracking system. – Impressive more powerful recoil feedback, Adjustable buttstock. – Tracker mode: ZomDay, Battle for the Last Chicken, Overkill VR, Contra VR, VR Battlefield, Arizona Sunshine, vr+. – Controller mode (need extra plugins): The NestVR, ZomDay, A-10,John Wick Chronicles. Depends on vive tracker 2.0 compatibility, More test games coming soon…. – VR game develop team commercial use. – VR shop or VR arcade commercial use. – VR Shooting Game fan personal use at home. 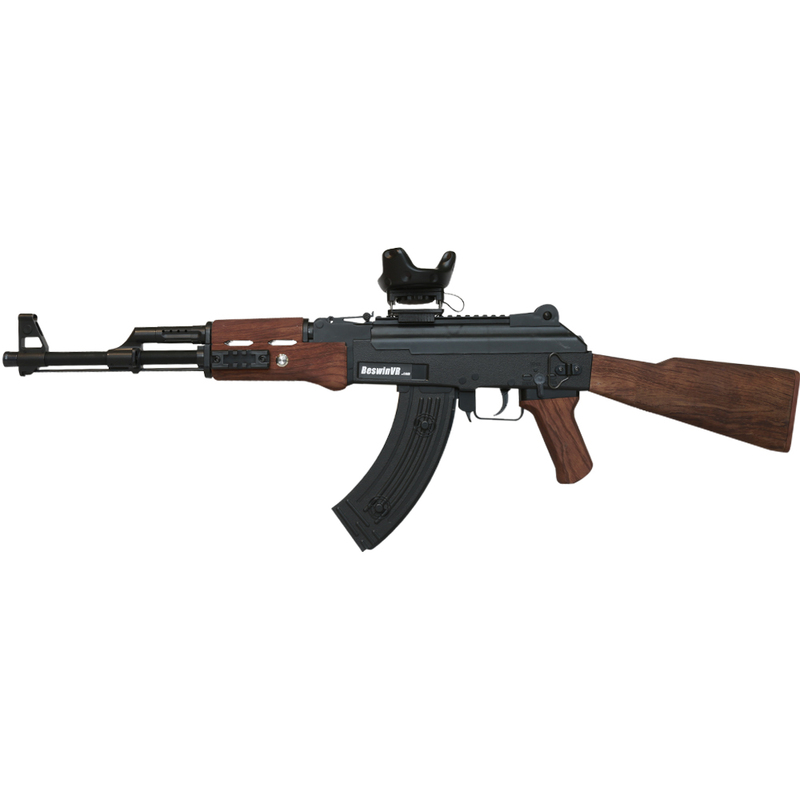 Here AK47VR Rifle price is usd469.99 each + air freight. Tracker 2.0 is not included that easy to buy from local market. Air express is expensive because handled by special shipping line, not regular cargo. it has risk to destroy, return by custom due to battery included and gun shaped looking product. Please contact sales@magp90.com if you have wholesales order to decrease air freight or sea shipping. BeswinVR® MAG P90® is Registered Trademark of Beswin, Inc. USA. ©MagP90.com, BeswinVR.com All Rights Reserved.